Here's Part 1 of the tutorial I promised in my post from 3/31/09. I hope to have Part 2 for you soon! Using one leg portion, open one of the seams the full length of the leg. I usually leave the topstitched seam intact and open the other seam. I use a seam ripper and/or small scissors. The hemmed edge (cuff) will become the bib/top portion of the apron. 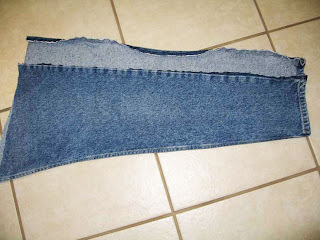 Cut off the hem and fold in half with the intact seam as the center of the fold. Cut out the curve portion for the “arm” area. 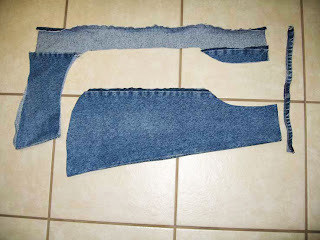 Shorten the leg to the length you desire and cut the bottom of the apron to your desired shape. 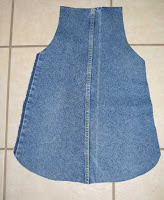 In my example, I made this apron 24” in length and “curved” the hem. 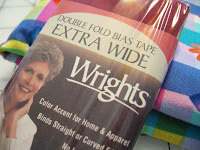 Apply bias tape to the top and around the bottom portion of the apron. I decided to make my own bias tape using instructions I found on the web. Cut 2 pieces of bias tape to serve as the ties for the apron. The length is based on your own preference of whether you want the ties long enough for making bows. I like long ties at both the neck and the waist. 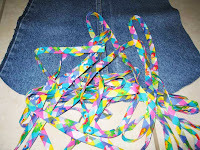 My bias tape strips are each 60” long. I measured the “arm” curve (10”) and added 20” for the neck section of the tie and added 30” for the waist section, hence 10” + 20” + 30” = 60”. 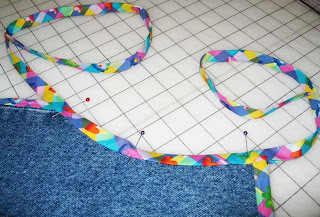 Pin the strips in place, and attach by sewing. I just turn the ends inward and stitch them down to finish. Now you are ready to add embellishments. I fashioned a pocket from the portion of the leg that I cut off in Step 3. I added bias tape around its perimeter, and then attached it to the apron. Note: I try to allow a little “hand room” when attaching. I then covered some buttons and added to the top! Here’s the finished apron! 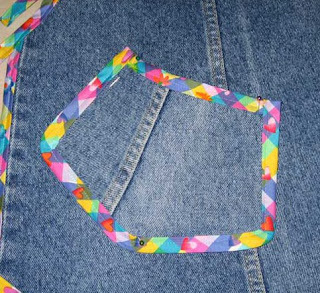 Here's a look at what I made from the other leg part of the jeans! 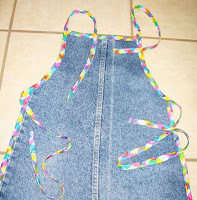 Now go search for those old jeans and make some aprons! 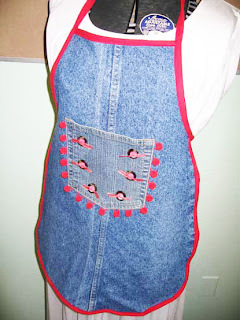 Part 2: half/waist aprons coming soon! That is so cute! I wish I lived close to you! Hi there - I found you from UBP. Great blog! 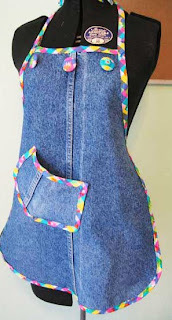 I am so in love with this apron project that we're going to link to it this week. Thank you for the awesome instructions! What a cool tutorial. 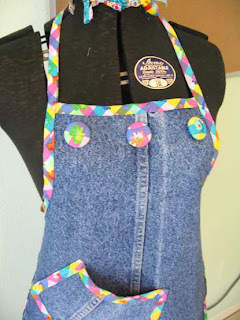 I've seen jeans turned aprons, but never done so well. So cute and unique! I will be linking! I wish I would've seen this on the 16th. We just had a women's retreat at our church. 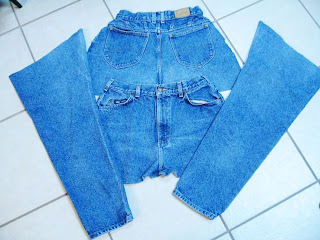 My friend and I showed ladies different things you can make with jeans and then helped them with their project choice. This would've been excellent to show! Always looking for new ways to repurpose things. Simple idea but brillant! 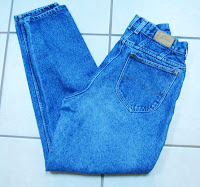 I have a stack of jeans that will now get smaller. Thanks bunches! This is a really great idea and tutorial! I WILL be making one of these!! Thank You!! 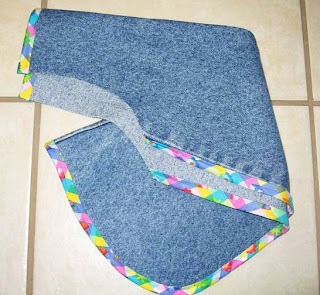 I just made this from my 9yr old son's pants for my niece's second birthday. It turned out really cute. 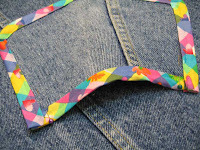 You can check it out at http://candco.blogspot.com/2009/05/sew-fun.html. THANKS for the great tutorial! This is absolutely adorable!!! 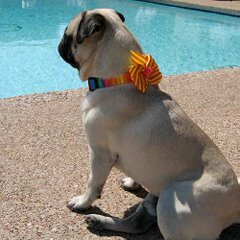 I especially like the the brightly-colored trim! I've posted a link on childmade.com. Thanks so much for sharing! très bonne idée!merci de ce partage. Hi! Great idea! Can't wait to make one! THANKS for sharing!